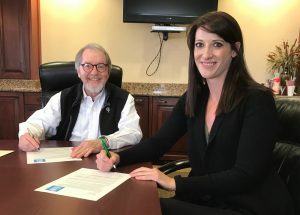 February 19, 2019 (MONTROSE, CO) — Habitat for Humanity of the San Juans has named Erica Weeks as new executive director of the non-profit. Weeks brings experience in the public sector, non-profit administration, grant writing and fundraising as well as an appreciation for safe, affordable housing to the position. “Housing is a top priority for our region and I share the vision that every family in Montrose, Ouray and San Miguel county deserves access and opportunity to a home that meets those standards,” said Weeks. “After an extensive national search, it’s great to find our new executive director right here in western Colorado. She brings great leadership and experience to the helm and the Board looks forward to working with Erica in continuing our efforts to provide affordable housing to the region,” said John Eloe, Chairman of the Board. Weeks grew up in the Olathe and Montrose area and graduated from Olathe High School. She completed her undergraduate degree in Political Science at the University of Colorado at Denver and will graduate in May with an advanced degree in Public Administration from Villanova University. 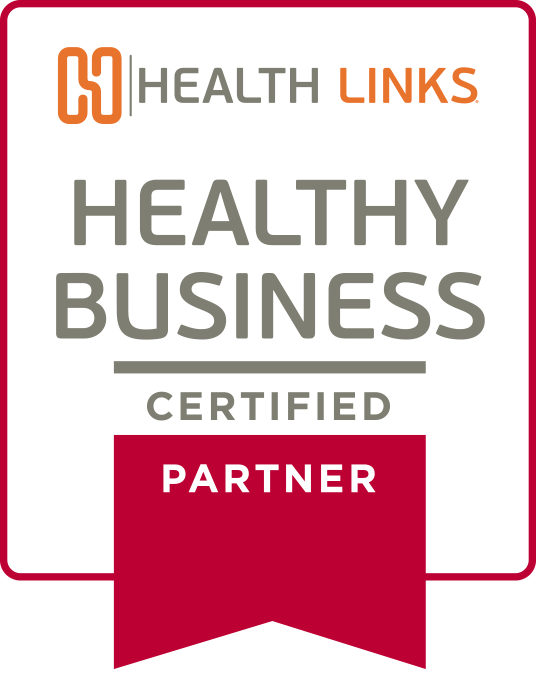 She also holds several certificates in city management and grant writing and management. “My vision has always been to serve the community and region I call home in a meaningful way. It is an honor to step into this position and I’m excited for the opportunity to work with the Habitat board and staff,” said Weeks. Weeks returned to Montrose in 2007. Since then, she has helped raise and manage over $17 million in grant procurements. Most recently, she has worked across the state with RPI Consulting to tackle many of the unique challenges that face rural communities, such as employment, business attraction and retention and community development. The local Habitat affiliate has seven homes, including triplexes in Montrose and Ridgway, slated for construction by the end of 2020. Weeks is excited to roll up her sleeves to see each of these projects through to completion, as well as to plan the organization’s next steps. To learn more about Habitat for Humanity of the San Juans or to join their efforts to connect more local families with safe homes and affordable mortgages, visit buildinglives.org. February 7, 2018 (MONTROSE, CO) — This February when Catalina Gomez makes her final mortgage payment on her home, it will mark both an enormous accomplishment and the realization of a goal that has shaped her life, and those of her children. After her divorce, Gomez and her children moved from Iowa to Montrose in search of the right community to call home. “Never in a million years did my mom ever dream she could own a home,” said Maribel Garcia, Gomez’s eldest child, now 30. In 1999 she found Montrose and a job at Russell Stover. In 2003 a friend told Gomez about the Habitat for Humanity program. Garcia remembers when she and her sister learned their family was accepted into the Habitat for Humanity affordable housing program. She and her sister were eager to pitch in, their brother was only a toddler. “We didn’t understand Habitat’s business model, but what we did know was that we had to help. We were excited to be a part of the process and get the project finished,” said Garcia. Like all Habitat families, Gomez and her family contributed hundreds of volunteer hours into building their home. Garcia said the experience shaped who she is today. With their mother’s encouragement, both Garcia and her sister, Adriana Morales, made their first real estate purchases at ages 20 and 21, which proved to be good investments for the sisters. “My mother showed us that we could achieve our goals as independent people,” said Garcia. Gomez continues to work at Russell Stover, where she has worked for nearly 20 years. But the message Gomez most wants most to relay to the community is how grateful she has been—and will always be—for the many volunteers that gave their time and energy to make her home a reality. Habitat for Humanity of the San Juans serves Montrose, Ouray and San Miguel counties and is currently building or planning new construction on triplexes in Montrose and Ridgway, once completed the organization will have built 59 homes for regional families since 1991. For information on how to volunteer for Habitat for Humanity of the San Juans, visit buildinglives.org. January 8, 2019 (Montrose, CO) — Habitat for Humanity of the San Juans has announced long-time Executive Director, Colleen Aller, will resign next month. The search for someone to fill the position has begun. Aller, who has held the top post since 2012, is widely recognized for raising the profile of the local organization by way of building homes and growing events, fundraising and membership efforts. Aller also ushered in a new era for the 28 year old non-profit by expanding revenue streams at the flagship ReStore and by launching ROOMS by Habitat, the highly curated resale store on Main Street in Montrose. Aller’s legacy, however, is likely to be the construction she oversaw during her tenure of twelve new homes, and the seven additional homes—including the nearly finished triplex on Park Ave., in Montrose and another planned for Ridgway—slated for construction by 2020. “Together our staff, volunteers, board and our community has worked hand in hand to fortify Habitat for Humanity of the San Juans. There’s been a lot of excitement, growth and of course real and lasting impact on the lives of dozens of local families,” said Aller. “Our board thanks Colleen for her exceptional leadership. She’s inspired so many of us and leaves the organization poised to grow to even new heights,” said John Eloe, chair of Habitat’s board. 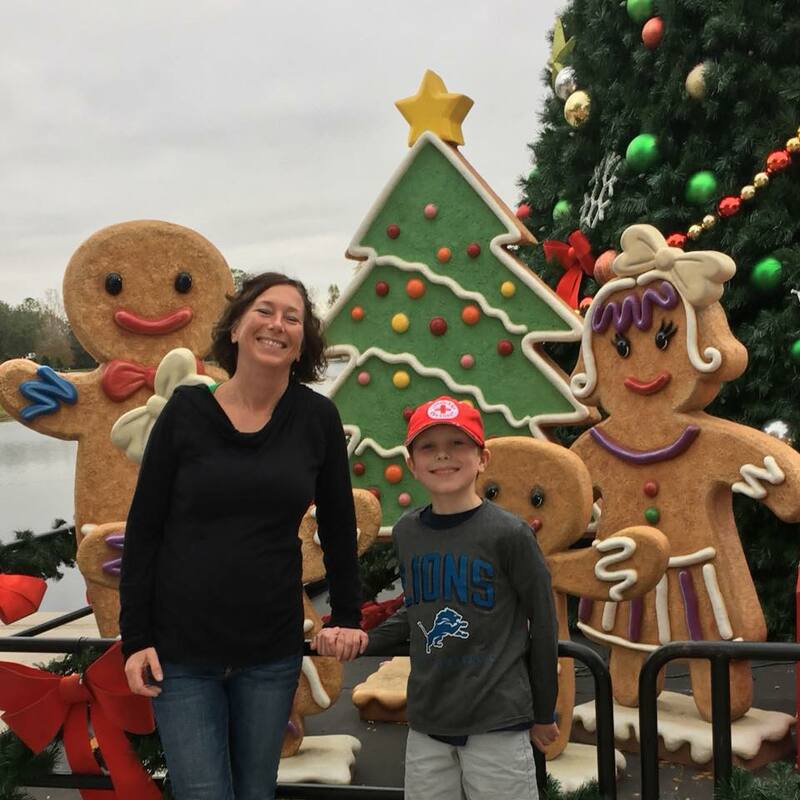 After seeing Habitat through the transition, Aller intends to pursue family priorities and other opportunities that allow for maximum flexibility while she and her husband Billy focus on raising the last two of their five children. A job description and application details for Habitat’s executive director position are available here. October 22, 2018 (MONTROSE, CO) — Each year tens of thousands of dollars are donated by locals to Habitat for Humanity of the San Juans, 100 percent of those funds, according to the organization, go directly towards construction costs. The board of directors at the local Habitat for Humanity affiliate incorporates non-profit financial management “best practices” to ensure the organization is as solid as the homes they build. Since 1991, Habitat for Humanity of the San Juans have worked with the community to build over fifty houses. They’re currently constructing a triplex in Montrose, with another planned for Ridgway. Housing opportunities are also currently available in Norwood. 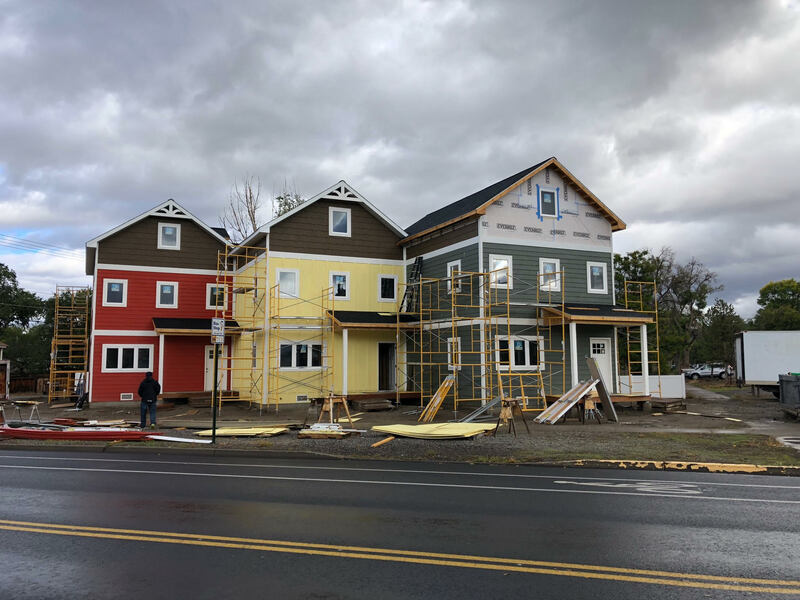 One of the most satisfying things you can do is drive by the Habitat for Humanity triplex currently under construction on Park Avenue, according to Habitat’s Director, Colleen Aller. According to Aller, Habitat for Humanity of the San Juans models itself in the same image as Habitat for Humanity International, which Forbes magazine ranks as number 6 in its list of Top 100 Charities. Come early spring, three local families including five adults and six children will walk through those doors on Park Avenue, unpack their belongings, and perhaps breathe a little easier knowing they have a home, with a mortgage they can afford, and a place to raise their families for years to come. According to Habitat, children of homeowners are 25 percent more likely to graduate high school and those who grow up in a Habitat home are twice as likely to go to college, compared to the local average for similar demographic and economic groups. Future Habitat homeowners are selected locally, with the criteria centering on their need for decent housing, their ability to repay an affordable mortgage and their willingness to partner with Habitat to build or improve a place they can call home. Those future homeowners perform hundreds of hours of sweat equity, which can take many forms: building their home or a home for another family, build-site clean-up, working in a Habitat ReStore, assisting in administrative duties, or countless other ways of helping out. Starting this winter, children also can contribute by earning good grades in school. According to Aller, her organization intends roll out a new policy to award one hour of sweat equity for every “A” a Habitat child earns. Habitat for Humanity of the San Juans accepts one time donations and also offers a monthly giving program for automatic payments and perks for membership. For more information visit buildinglives.org. 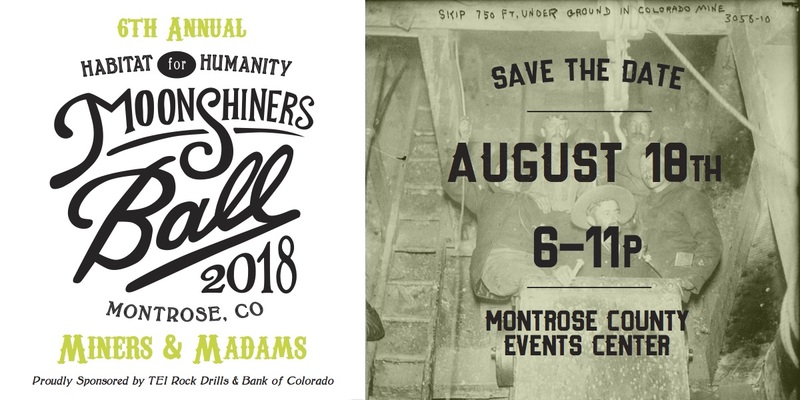 JUNE 5, 2018 (MONTROSE, CO) — Habitat for Humanity of The San Juans will host their sixth annual Moonshiners Ball at the Montrose County Event Center. They say it’s the most important fundraiser they’ve ever held. This year’s theme is “Miners & Madams,” and the event will be held from 6 -11p.m. on August 18. Bank of Colorado and TEI Rock Drills are presenting sponsors. “Expect an evening of chance, mining, panning for prizes, auctions and outrageous entertainment,” said Burke. Like other years, guests are encouraged to dress up to match the theme. Attendees must be 21 or older. Tickets range from $65 for Early Birds and $150 for VIP admission. A ticket to one of Montrose’s most anticipated Summer event includes catering by The Yellow Carrot, a moonshine drink and a souvenir glass. There will be a cash bar for general admission guests. VIP guests are invited early for a reception and have access to a full hosted bar. Money raised by the Moonshiners Ball will benefit the affordable housing triplex currently under construction on Park Avenue in Montrose; another triplex in Ridgway; and an additional single-family home in Montrose, all slated for construction in the next two years. The local Habitat affiliate serves Montrose, Ouray and San Miguel counties. When the seven new homes are completed, total new home construction for this organization will balloon to 59 homes since 1991. “This is absolutely the most important fundraiser we’ve ever held. If you go big one night this summer, do it with us. You’ll have a good time and make a big impact in the community,” said Burke. Sponsorships are still available for businesses or individuals. Visit buildinglives.org for more info or for ticket information. February 21, 2018 (MONTROSE, CO) — Habitat for Humanity of the San Juans has two homes available in Norwood and Montrose and is looking for qualified families to fill them. Habitat for Humanity of the San Juans is looking for qualified applicants for a affordable homes in Norwood & Montrose. The Norwood home is a single story, 1,092 sq.ft. residence located in the Pine Street Gardens, Habitat for Humanity neighborhood. It has three bedrooms and two baths. The Montrose home is part of the Triplex currently under construction on Park Ave. This home is three stories and includes three bedrooms and two bathrooms and is 1500 sq.ft. “Long-term housing is a serious issue for so many. These homes, with affordable mortgages, will be serious game changers for the right family,” said Habitat Assistant Director Deidre Becker. The Norwood home represents a Habitat success story. According to Colleen Burke, executive director of the local Habitat affiliate, the previous owner helped build the house in 2010 and thanks to the affordability of the mortgage, she was able to save enough money in the intervening years to build her dream home. “By selling her Habitat home back to us, she returned a home to the Habitat inventory for another family to make great use of,” she said. Since 1991, Habitat for Humanity of the San Juans have worked with the community to build over fifty houses. By 2020 they will have built 59 homes. Housing opportunities are also currently available in Montrose and Ridgway. “Our application process is straightforward. And with the Norwood house already built and the Montrose triplex already in construction, the new homeowners could be in their new homes quickly,” said Becker. Through Habitat’s homeownership program, the nonprofit is able to sell homes to qualified families at a 0-3% interest rate, with only a $500 down payment, and a set monthly mortgage payment that does not exceed 30% of the family’s gross monthly income. According to Habitat for Humanity of the San Juans, homeownership has a profound impact on families and communities. Children of homeowners are 25 percent more likely to graduate high school and 116 percent more likely to graduate from college. There is a $25 application fee. For more information or to apply contact Deidre Becker at (970) 252.9303 ext 5. February 2, 2018 (MONTROSE, CO) — Habitat for Humanity of the San Juans announced this week that Lisa VanAllsburg has been recognized by the organization with an Outstanding Service Award. VanAllsburg is the office assistant at the local Habitat for Humanity affiliate and also assists in Donor Relations, a position she’s held since September, 2016. VanAllburg was recognized by her fellow employees last week with a plaque and a gift certificate, as a token of their gratitude for her efforts. “It’s our way of letting her know we appreciate her and everything she does,” said Burke. VanAllsburg was touched by the award. “Working with such a wonderful group of people, our partner families and the community makes my job a pleasure every day,” she said. After volunteering with several non-profits throughout Montrose, VanAllsburg was excited to join the Habitat staff. “The commitment to families and community make me proud to call Habitat a ‘second family’ for my son and I,” she said. “Lisa plays a very important role in making sure we are running smoothly during this incredibly important time for our organization and community,” said Burke. By 2020, Habitat for Humanity of the San Juans will have built seven new homes, including two new triplexes in Montrose and Ridgway, bringing their total new home construction to 59 homes since 1991. January 19, 2018 (MONTROSE, CO) – An open door is an oft-used analogy for opportunity, a metaphor likely not lost on Alpine Bank of Montrose as they pledge $10,000 to cover the cost of every door for Habitat for Humanity of the San Juans’ new triplex housing project. Alpine Bank’s donation is only the latest demonstration of broad community support for the triplex project, according to Colleen Burke, executive director of the local Habitat affiliate. This month alone hundreds of volunteer hours will be spent during Build Days, including one sponsored by Alpine Bank and another by the First Presbyterian Church in Montrose. On Saturday, January 20, volunteers from the First Presbyterian Church in Montrose will gather at the triplex on 333 Park Avenue South, Montrose. The following Saturday, January 27, Alpine Bank’s employees will continue the work of raising the triplex’s second story walls. Build Days, as events like these are called, are crucial to Habitat’s process. “It’s community outpouring like this that make our mission possible,” said Burke. Other sponsors of this triplex housing project include DMEA—who also have committed cash towards construction costs; Academy Mortgage; Corks Fine Wines and Spirits; Motley Architecture Design; Dynamic Integration; D&S Underground; City of Montrose; Montrose Women’s Club; and Mesa Engineering and Surveying. Build Days have also been scheduled for other regional groups including Target; Bank of Colorado; Coldwell Banker; Rotary Club of Montrose; Wells Fargo; Crossfit Agoge; and United Church of the San Juans. Coffee Trader generously provides free coffee at every Build Day while Jimmy John’s sponsors lunch. Habitat for Humanity of the San Juans serves Montrose, Ouray and San Miguel counties and is currently planning and building new triplexes in both Montrose and Ridgway; bringing their total new home construction to 59 homes since 1991. For more information about this event contact Weesa Hild, 970-252-9303 ext. 7.
WHO: Volunteers from the First Presbyterian Church and Alpine Bank in Montrose. WHAT: Habitat for Humanity of the San Juans Build Day at the Montrose Triplex. WHERE: 333 Park Avenue South, Montrose. CONTACT: Weesa Hild, 970-252-9303 ext. 7. November 22, 2017 (MONTROSE, CO) — Habitat for Humanity of the San Juans announced this week four families—including seven children—chosen to join their affordable mortgage home ownership program. Two of the families will occupy the triplex currently under construction on Park Avenue in Montrose. The third, a family with multi-generational members, will work with the organization to build a home on Bluegrass Court in Montrose. Montana Pizzarusso and her two children, Easton, age 2 and Jax, age 4 are already looking forward to spending more time together as a family. “This opportunity means so much to us, the affordability will allow me to spend more time with my children,” said Pizzarusso. There is one triplex home still available and Habitat for Humanity of the San Juans is currently accepting applications. For Les and Kaitlyn Mascarenas, their growing brood includes Les’s elderly father, Isabella, age 10, her nine year old brother, Emilio and a new sibling on the way. For them, it’s all about having room to grow. “Currently we rent a two bedroom house and are always caught up in trying to make ends meet,” said Mrs. Mascarenas. Each family will volunteer at least 250 hours to help construct their home; upon completion of the triplex and the single family home, each of these families will purchase their home at a zero percent interest mortgage. According to Habitat for Humanity of the San Juans, Executive Director Colleen Burke, the community is also leaning in with extraordinary support for these projects and families. Corporate sponsors include DMEA, Alpine Bank, Academy Mortgage, Motley Architecture Design, Dynamic Integration, D&S Underground, City of Montrose, Montrose Forest Products, Montrose Women’s Club and Mesa Engineering and Surveying. Build Days have also been sponsored by regional groups including Target, Bank of Colorado, Coldwell Banker, Wells Fargo, Crossfit Agoge, Alpine Bank and United Church of the San Juans who send their employees to the construction site for the day to help install floors and raise walls. Habitat for Humanity of the San Juans serves Montrose, Ouray and San Miguel counties and is currently planning and building new construction on homes in both Montrose and Ridgway, which will bring their total new home construction to 59 homes since 1991. Naturally, more volunteers are always needed and the entire community is encouraged to make an impact with these four families. “When you support Habitat, you’re helping neighbors achieve a simple, healthier and better life,” said Pizzarusso. November 9, 2017 (MONTROSE, CO) — Fueled by coffee donated from Coffee Trader, this Saturday, volunteers from the Rotary Club of Montrose will gather at Habitat of Humanity of the San Juans’ new triplex build site in Montrose to help build three homes for local families. From 8 a.m. – 3 p.m. on Saturday, November 11, volunteers will take the day to construct the first floor walls of the triplex. “Build Days are crucial to our whole process. It’s committed volunteers like these, along with the families who will live in these homes, that make our mission possible,” said Weesa Hild, event and volunteer coordinator at Habitat. The Rotary Club, among many other organizations has committed to Build Days as part of broad community support for the triplex project on 333 Park Avenue South, Montrose. The Rotary Club also made a cash donation towards construction costs. Other sponsors of this particular project include DMEA, Alpine Bank, Academy Mortgage, Motley Architecture Design, Dynamic Integration, D&S Underground, City of Montrose, Montrose Women’s Club and Mesa Engineering and Surveying. Build Days have also been scheduled for other regional groups including Target, Bank of Colorado, Coldwell Banker, Wells Fargo, Crossfit Agoge, Alpine Bank and United Church of the San Juans. Habitat for Humanity of the San Juans serves Montrose, Ouray and San Miguel counties and is currently planning and building new construction on triplexes in both Montrose and Ridgway, which will bring their total new home construction to 58 homes since 1991. Call 970-252-9304 x 8 to schedule a FREE pick-up or schedule a pick-up online. Sign up for our Newsletter and learn more about how you can help! Thank you for your interest in learning more about your local Habitat for Humanity.